Entero Automation - El Paso, TX. Entero Automation is a full service industrial control and systems integration company for Municipal Water and Waste Water Treatment, Motor Control, Chemical Injection, Manufacturing and Food Processing. We have the experience and skill to provide systems that fit the needs of applications for SCADA, RTU, HMI, instrumentation, and industrial networking. Entero Automation is one the Soutwest's premier electrical control panel fabrication companys. We have experienced project managers and systems specialists that follow the progress of each panel through every stage of the fabrication process; from reviewing your drawing and specifications package, through the submittal assessment, and culminating with the assembly process. start-up at the job site facility. 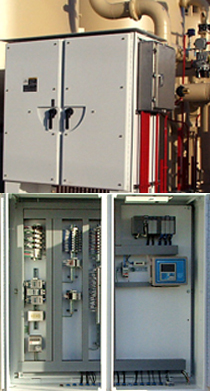 As-Built CAD drawings of the panel are provided with each enclosure for ease of field installation and maintenance.